On Sunday 20th January 2019 at around 11am I got a phone call from my friend Phil Rhodes who informed me he had found a Reed Warbler or Blyth’s Reed Warbler at Hope Carr NR near Leigh. As I was doing my WeBS count in Bolton it wasn’t until nearly 1pm by the time I got to the site. Phil was still there watching the bird in a bramble patch by the perimeter fence adjacent to the filtration beds. Andy Makin had also arrived and the bird continued to show well on what was a very mild, calm day with sunny intervals. After a further hour or so watching the bird we had convinced ourselves that it was most likely a Reed Warbler, which in itself would be an amazing record for Greater Manchester in the middle of January! We heard the bird call on several occasions and to the human ear it was difficult to say whether it was any different to a Reed Warbler. The colouration and behaviour / posture of the bird seemed to fit Reed Warbler even though the primaries did seem slightly short. Separation of Reed and Blyth’s Reed Warbler can be very difficult in the field and even the field guide features can be open to interpretation. 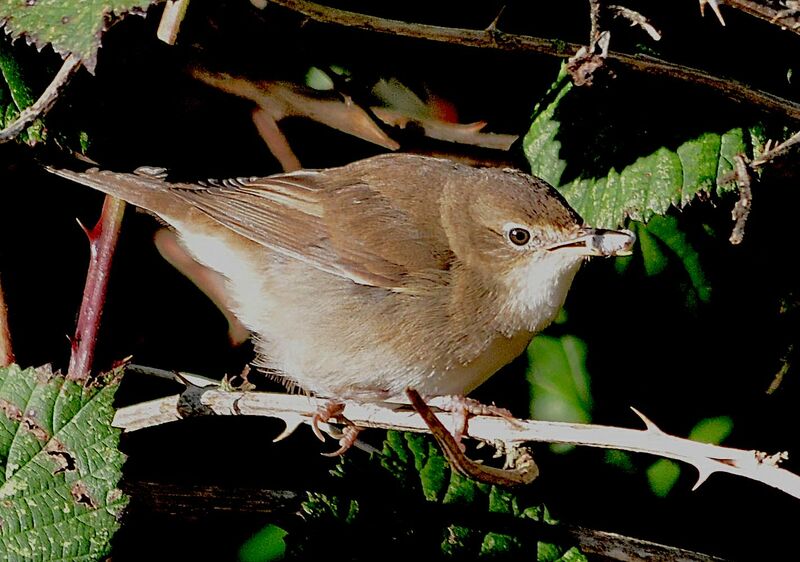 Later that evening having posted photos of the bird on Twitter I was contacted by Chris Batty at Rare Bird Alert who felt confident from the photos that the bird was in fact a Blyth’s Reed Warbler! Luckily one of the photos showed a short P2 (primary tips number from 1-10), which could be seen to be much shorter than P3 and P4 (which form the wing tips). In Reed Warbler P2 should equal P4. An emargination on P4, which our bird had, is also a strong indicator of Blyth’s Reed Warbler as this is rare in Reed Warbler. In the field we noticed the bird had a pale wing panel and it is thought this is because the bird had not yet completed its first year moult and has yet to replace any of its secondary feathers. Luckily Andy had captured the bird calling several times on video which Chris Batty converted to a .wav file. The call was compared with a random Blyth’s Reed Warbler cut and Reed Warbler from xeno-canto (an online bird call and song resource) and the differences were obvious. The sonogram above shows the Hope Carr warbler (top) a perfect match with Blyth’s Reed Warbler (middle) and whereas Reed Warbler (bottom) is a more drawn out “trrk” call. The Blyth’s call is slightly shorter “tic” type call similar to a Lesser Whitethroat. The call confirmed that the bird was no doubt a Blyth’s Reed Warbler which would be rare anywhere in Western Europe during winter never mind at an inland site near Leigh. The bird should be in India at this time of year. Phil said he had heard briefly what he thought could have been a Lesser Whitethroat call in that area in December so it is likely the bird could have present over a month. Thankfully after a few days of cold and foggy weather, many birders were able to see the bird well and in fact on Monday 28th January it showed very well indeed when these photos were taken by Dave Shallcross, Gary Crowder and John Preston. An amazing first ever record for Greater Manchester.